Ozeki NG allows you to maintain a log of every incoming and outgoing SMS in a database. This option can be useful if you want to use SQL queries to produce various reports. SQL logging can be configured with any database server the has an ODBC or OleDb driver. 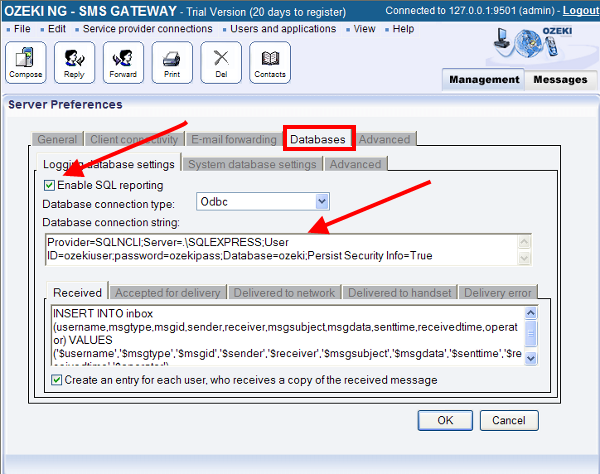 For example you can use MSSQL, Oracle, Access, MySQL, Postgres, etc... to store SMS traffic information. The SQL logging option allows you to specify the database connection string and the SQL statements used to store the traffic information. The SQL statements are SQL templates that hold keywords that are replaced to the appropriate content, prior to the execution of the SQL command. To enable SQL logging you should open the Server preferences form from the Edit menu. In the server preferences form click on Databases tab, then select Logging database settings (Figure 1). On this form check the Enable SQL reporting checkbox.